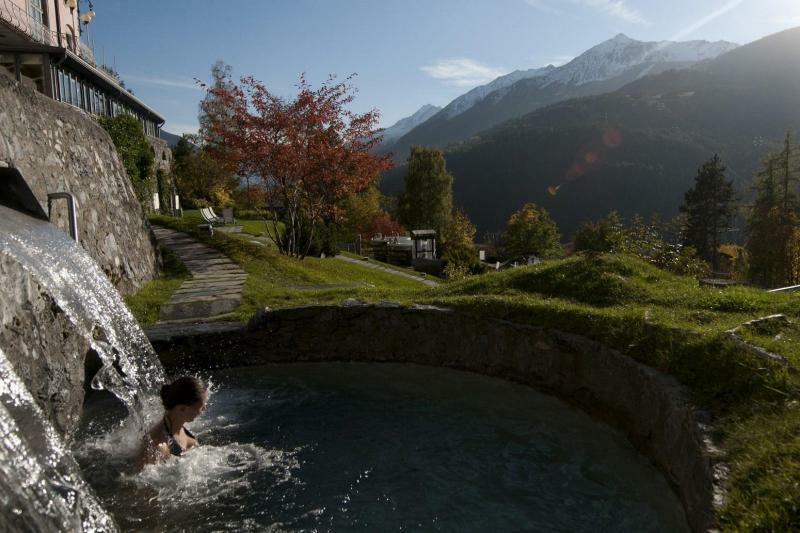 This unique spa break in the Italian Alps is a wonderfully relaxing, revitalizing mini break. 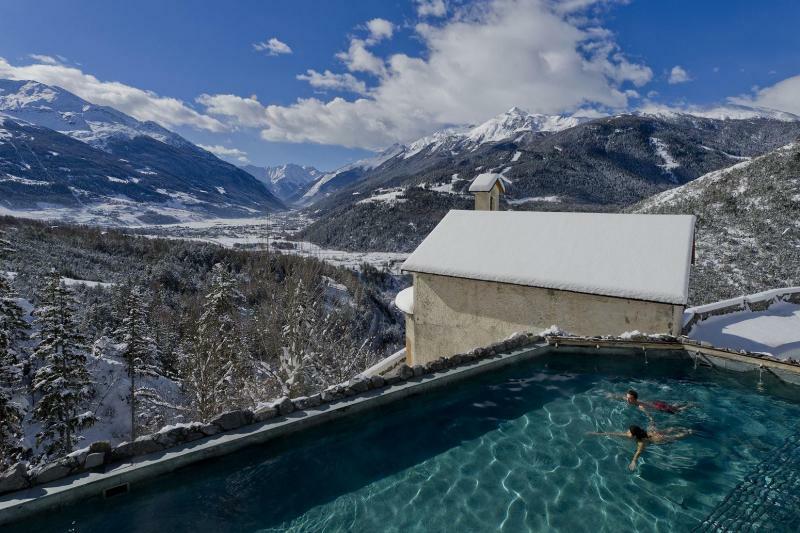 Pamper yourself at 5* Grand Hotel Bagni Nuovi in Bormio, soak in the thermal waters while taking in the fantastic mountain views and enjoy a 50 minute massage treatment from the selection below. This is also a very special gift idea! A gentle exfoliation treatment rich in minerals, vitamins, amino acids and antioxidants, nourishing the skin and fighting free radicals. A special massage with natural exfoliating effects that oxygenates and revitalises the skin using a mix of Himalayan pink salt and alpine herbs. A treatment that smooths cellulite, firms the skin and remodels your silhouette. This massage re-calibrates your body’s hormonal and energetic balance, promotes detoxification and remodels and drains at the cellular level. A gentle massage indicated in cases of water retention, to help reduce lymphatic stasis, cellulite, and swollen and heavy legs. Effective not only in the treatment of cellulite and stretch marks, but also in treating acne and rosacea, and as as both pre- and post-operation support. A massage that involves all muscle groups. This therapeutic and energetic massage is preferably applied on stressed and fatigued areas of your body before or after physical exercise, in order to prepare or de-fatigue your muscles. A massage that focuses on the shoulders, back, and spine helping to relieve tight muscles. Its soothing effect relieves pain caused by poor posture and fatigue in general. A soft and fluid massage facilitating physical and spiritual fulfilment. The fundamentals of the Ayurvedic philosophy are based on the release of energy channels, promoting deep sleep, regulating appetite and making life more joyful. Plantar reflexology regards the feet as the mirror of the body. This foot massage acts on different pressure points, allowing you to rediscover the natural harmony between the different body systems, organs and mind. A delectable, intoxicating multi-sensory massage. Thanks to the stimulation of endorphins it helps to lift your mood and encourages relaxation. It gives the skin a soft and voluptuous feel by deeply hydrating the body thanks to its vitamin A and mineral salt content. Bormio (1225m) is a beautiful spa town and ski resort located in the Alta Valtellina just north east of Lake Como and close to the Swiss border. Ideal for skiers and non skiers alike, it offers a pretty, historic town centre, an indoor ice skating rink, excellent restaurants for all budgets, and three thermal spa centres - from the historic Bagni Vecchi which dates back to Ancient Roman times, to the Bormio Terme with its indoor and outdoor swimming pools, waterslide for kids and 'thermarium' spa for adults. Explore the historic town centre, with its medieval churches, upmarket shops, café bars and restaurants. For those who are interested in history and the local area there is the civic museum and the mineralogical museum. Other activities include ice skating, husky dog sledging in nearby Arnoga, night skiing once a week, swimming at Bormio Terme, snowshoe excursions, cross country skiing, the Bernina train to St. Moritz, and much more. There are a number of good restaurants around Bormio, from rustic family run restaurants offering traditional local fare, to more refined choices (including one with a Michelin star), and of course a number of pizzerias. Built in 1836 and completely renovated in 2004, the historic Grand Hotel Bagni Nuovi offers a truly luxurious experience thanks to the famous thermal baths located on site. Located in a secluded position just outside Bormio the hotel offers wonderful views of the surrounding mountainside. The hotel, an excellent example of liberty architecture, offers a 24 hour reception, Salone dei Balli restaurant, Light Café, bar, free WiFi access, heated ski deposit with CCV TV and controlled access, parking service, games rooms, meeting rooms, free shuttle bus service to the centre of Bormio and the ski area. All rooms come complete with telephone, SKY TV, safe, minibar, hairdryer and bathrobes. Kettle and selection of teas in most rooms. Balcony on request. Buffet breakfast is included in the price. The Salone dei Balli Restaurant is open to hotel guests and non guests, reservation required. 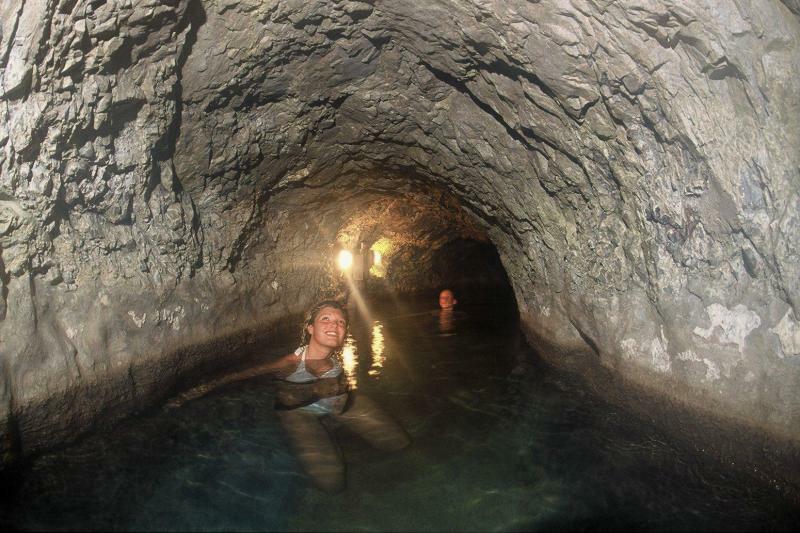 The thermal springs around the Bormio area have attracted people to the area since ancient Roman times; Leonardo Da Vinci mentioned the original baths in his writings. The water is naturally heated under the mountainside to between 37 and 43°C all year round. 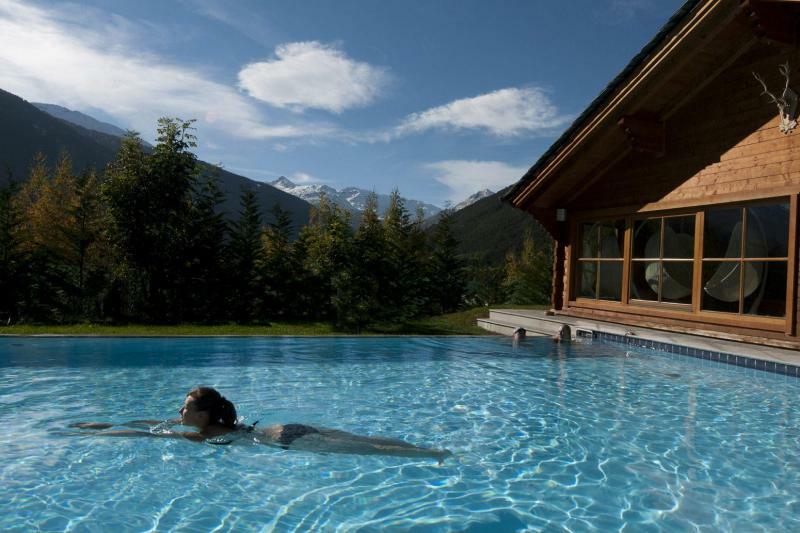 Today the Bagni di Bormio offer two thermal spas, the ‘Bagni Vecchi’ (Old Baths) and the ‘Bagni Nuovi’ (New Baths). The Bagni Nuovi Spa offers thirty different thermal pools, saunas, steam rooms in a luxury setting for total relaxation. 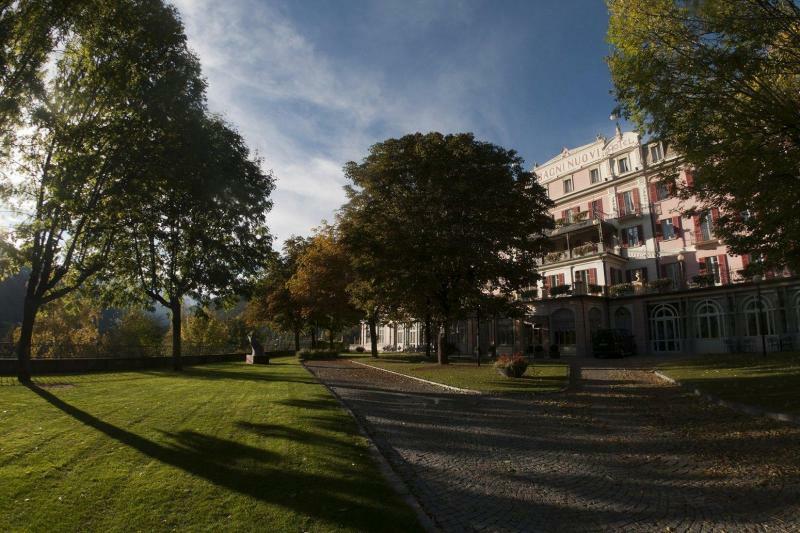 A splendid garden is accessible throughout the year with different pools and baths so you can sit outside in the warm thermal water surrounded by beautiful snowy views in the winter, or lush green mountainside in the summer. The Bagni Vecchi spa begins with a visit to a cave dug into the rock for a soak in the thermal water, continues with a visit to the ‘Medieval Baths’ where various saunas and steam rooms let you sweat out any impurities, followed by the ‘Imperial Baths’ where various thermal pools relax and reinvigorate, leading to the splendid outdoor pool with a fantastic view over Bormio and the surrounding valley. From there you can also head down into the secluded gardens and visit the atmospheric old ‘Roman Baths’ which date back to ancient Roman times. There is free internal access to the Bagni Nuovi spa from the hotel, and free access to the Bagni Vecchi spa via free shuttle bus or a 10 minute walk through the private park that joins the two. Extra beauty treatments and massages are available on request, to be paid separately. Exit Orio al serio, follow signs for Lovere, then Edolo-Passo del Tonale. At Edolo, turn left at the crossroads and continue on to Aprica then Tirano via the Aprica Pass and follow signs to Bormio. Alternatively take the road alongside Lake Como following signs to Lecco, then to Colico, Sondrio, Tirano, Bormio. This route is straighter than the first and there are no winding mountain passes. You can either take a bus direct from the airport to Bormio with Livignoexpress.com, or take a bus to Bergamo train station then the train to Tirano (changing at Lecco), then take a bus to Bormio with busperego.com. There are direct trains from Milan Central station to Tirano.